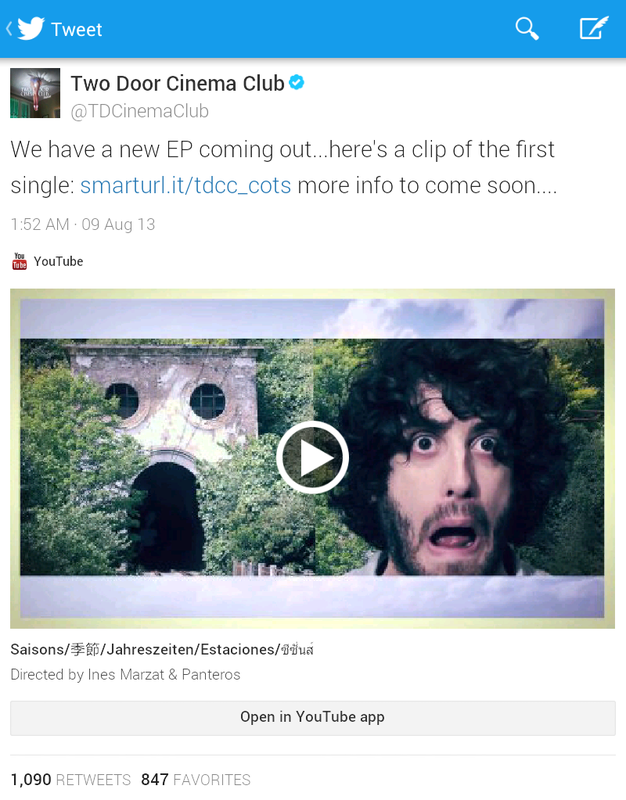 So when on 6 August, Kevin Baird -Bassist of Two Door Cinema Club-, tweet something like in this picture below, I was really curious. Naturally, I checked their official site to see if there was any announcement, but there isn't anything. Then I checked their Youtube to found out that they upload a new song without any further information or caption. Just 30 seconds, but it certainly a new song. So I didn't surprised when yesterday they finally announced it. 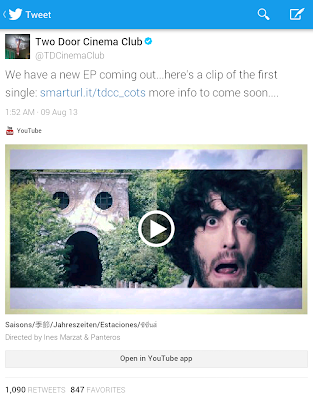 They will release a new EP! The title of the song is rumored to be "Changing of Seasons" and it will be out on 20 August. But once again, it's still a rumor. There isn't any official information yet. I was surprised to found the first 20 seconds of the song is quite "heavy" on drums. Maybe they finally have a drummer! Ha ha ha. I'm just kidding. After those 20 seconds, it's Sam's guitar sound that make me sure that this is still Two Door Cinema Club that I know. I'm looking forward for their new EP! I might even buy it on iTunes. It seems I can't find their music in CD stores so iTunes is my best bet to support them (by legally buy their songs). The only thing that prevent me from buy music on iTunes is the rumor that I couldn't play those song on my androids (my iPod is with my sister). Now that I know it can, it doesn't matter anymore. By the way, I really can't wait to hear their new song. How about you? What? You don't know them? Please refer to this page to found information about them. Surely they're one of bands that I recommend you to hear.